Last Saturday evening a lone photographer at Hole in the Wall Beach, near Santa Cruz, California braved high tide on this ledge of rock waiting for the moonrise as the sun set behind and to the right of the frame. He was also patient enough to stay put for this 2-minute exposure! It is probably someone on flickr. Any ideas? No HDR. MYSTERY SOLVED! This is David Shield. See his shot here. I hear that he likes moonlight swims in the sea! 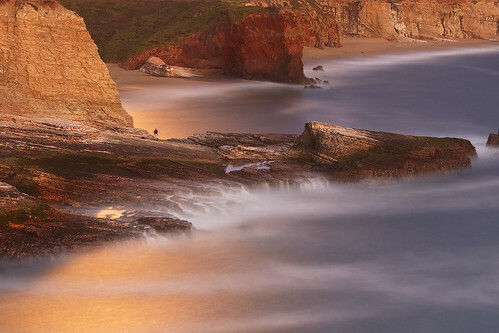 See the photographer battling the elements in this 1800 pixel version!! So, there I was doing a small group workshop on the top of a cliff. The sunset was red, but I kept watching the moonlight on the ocean as the almost full-moon rose opposite to the sun. As it got darker, the moonlight got relatively brighter. Eventually the light between the moon and the sun became even. These short moments near the full-moon can produce unusual lighting effects. I have another one from near Carmel that I'll show later with huge waves lit by a rising sun while the setting moon lit up the foreground water. You should try this sometime! Sometimes people get upset when photographers get in 'their shot.' But I say, "okay, hold still now!" state Government. of California website and the new Governor, Jerry Brown's website too. Have a look! It is Flash with my pics cut into layers for a 3-d slideshow. If you are into building apps, the State has opened up lots of data to the public, so check it out! A great weather mashup map of the world with local temperatures, weather and nice popups. See where it is hot and not!